Did you take your kids fishing this year? My kids are all grown up with kids of their own now. And I think grandkids are the most fun because of course I can spoil them and send them back home. 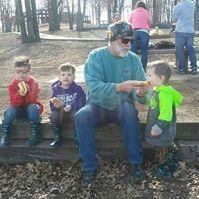 Really though, I absolutely love my kids and my grandkids, so much so that I take them fishing about as often as I can. This all started back when I was a kid and like many of you we went fishing with one or both of our parents or maybe a grandparent or other family member or even a friend. It doesn’t matter who we went with it just matters that we got to go fishing. I can still remember what I believe was my first fishing experience. It was at a little body of water in Oklahoma called Hula Lake. My mom and dad took us kids to the lake and while I don’t remember my brothers being there with me I do know they were there, and since they were older they were probably off fishing on their own. Anyway I was seated on the concrete dam dropping a worm and cork in the corner of two concrete walls. I pulled up fish after fish and I remember laughing out loud each time and the fact that I couldn’t wait to get my rig back in the water. There was a man there who, as my dad explained was going to set a trot line that day and he wanted all the perch I could catch for him. I was more than happy to oblige him, of course and never even gave a thought to his taking my fish. I remember knowing what a trot line was or at least knowing he was going to catch big fish with my little fish. I guess one of the advantages of growing up in a family of hunters and fishermen is that one receives an education in such things without knowing it. I suppose I learned most of the basics about life just listening to my folks talk with other people about what was going on in their lives. My dad owned a second hand furniture store in Bartlesville, Oklahoma called the Idle Article. I used to spend days there before I was old enough to go to school and during summer break when I was older. I always tried out the bicycles as soon as they hit the store and he took me with him sometimes to pick up a load of furniture he had bought. I don’t know how long he owned it but I do remember when a new street project was planned he sold out and went into business with his brother making horse trailers in Dewey, Oklahoma. Now that shop was a dangerous place for a little kid, what with all the cutting, grinding and moving machinery. I did get to go with him sometimes but it was usually on Saturday when only a few people were there. I remember my mom driving me by the old store on the new street, which was actually a much wider by-pass sort of thing and seeing the outside of the building and a concrete retaining wall just six or so feet from the front wall of the building. The parking lot in front was gone and without having it explained to me I knew just why dad didn’t have a business there anymore. That’s progress though and I’m sure it created more opportunities than it erased. That word progress is sure used a lot. We use it to describe the good things that go on and we use to define the failures of government also. Personally I like to use the word “progress” to describe my fishing prowess. I started out fishing by myself in a pond behind our house with my best friend Tony Parker. Please understand the words “by myself” mean without my dad or mom or brothers you know, the people who told us we couldn’t jump in the pond or off the back of the dam into the creek. This little pond was a perfect spot for a couple of kids to explore. We sought out bullfrogs and bass along with all the trotline bait we could catch although, we never baited a trotline. I also saw the absolute biggest snapping turtle I had ever seen. Thinking back now it was probably only sixteen or so inches across but that was one third of my height back then. When we got a little older, like maybe ten we began fishing the creek that ran by the park a little farther from the house. I later learned that creek was the Caney River or maybe the Little Caney. I still don’t know which but I’ll bet I could look it up on Google Maps real quick and find out… now that’s progress. My folks took us fishing in a number of places. I remember we camped for a week or so at Beaver Lake in Arkansas the year it opened for fishing. We were there with my Uncle Donnie and Aunt Joyce and my Grandpa “Pappy” and Grandma “Pansy”. This is the only memory I have of grandma Pansy as, sadly she died later that year. I believe we caught all the Sand bass out of Beaver lake year that trip and I’m sure my mom got tired of cold hot dogs in her sleeping bag but she didn’t complain. That was the year my dad tried to explain to me what blacktop was. Let’s see now, was it the whole road or just the black stripes we actually drove on that made up the blacktop. One can probably figure out the questions I had and the exasperation my dad must have felt as he patiently told me again what it was. I’m all grown up now with kids of my own and grandkids too, as I mentioned earlier and I can hear myself in the questions that all of them have asked over the past thirty years. Why is Deer poop so small when a Deer is so big? Why do Coyotes howl at night? Do Channel cats really talk to you when you unhook them? Will you take me fishing? Parents probably have no idea how many questions they answer over the lifetime of raising kids but it has to be in the bazillions. I seriously doubt if all those questions were ever answered but I didn’t mind, I just asked again. When kids ask you to take them fishing and you are tempted to put them off with being too tired or it’s too windy or cold or you’re too busy please remember that one day our kids will have memories randomly pop into their heads about their parents and what we did with them when we were little. I just hope my kids remember me taking them and not putting them off.